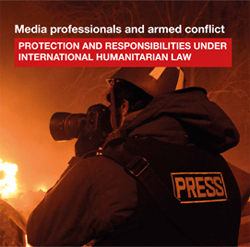 In November 2018 the British Red Cross launched the field guide and handbook Media Professionals and Armed Conflict: Protection and Responsibilities Under International Humanitarian Law (IHL) these publications will provide information to members of the media about their legal position under International Humanitarian Law (IHL). The handbook and field guide were the result of a project begun in In September 2012, by BIICL and commissioned by the British Red Cross, undertaking research into the legal position of media professionals in armed conflict. The research examined how International Humanitarian Law (IHL) protects the media in conflict zones. It also considered the IHL responsibilities of those media professionals that report from armed conflict. The research built on the ongoing work of the British Red Cross aimed at increasing awareness and understanding of IHL among media professionals. The research team consisted of Nicole Urban, Research Fellow in International Humanitarian Law, and Dr Andraz Zidar, Senior Research Fellow in Public International Law. "Media Professionals and International Humanitarian Law"